For assistance contact Client Support. The Trent University Library is pleased to offer Trent University Alumni Association members borrowing privileges at no charge. 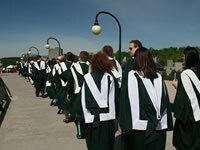 Alumni are subject to Trent University Borrowing Regulations and should familiarize themselves with the library policies. These privileges are extended to the registered owner only and are not transferable. The registered user is responsible for all fines and overdue, lost or damaged library materials. Borrowing privileges are suspended when overdue and/or fine limits are reached. Misuse of the library card or failure to respond to notices will result in the withdrawal of borrowing privileges. Presentation of a TrentU (student) card, with an Alumni authentication sticker attached or a Library borrowing card is required at all borrowing transactions. Borrowing privileges are valid for one year and may be renewed provided that outstanding fines are paid and no materials are overdue. Lost or stolen cards are to be reported immediately as follows; TrentU to the University Security Office and Library borrowing cards to the Library Service Desk. It is the responsibility of the user to inform the Library of a change to address or contact information. A library replacement card may be obtained at the Library Service Desk for a fee of $5.00. The online library catalogue and public online resources are available for use off campus. Access to our licensed online resources is restricted, based on individual agreements with suppliers. However some online resources are licensed for Alumni and are accessible via MyTrent login authentication. Other services available during operating hours include access to the physical collection and the Archives, obtaining general collection assistance, use of public access computers, photocopiers and microform reading/printing equipment. Alumni may borrow books for 14 days with three renewals, provided they have not been requested by another user. Users are advised to review the Borrowing Regulations for details regarding specific material type loan periods and limits. Alumni are not eligible to place holds, or borrow material from Curriculum, Media (DVD and VHS) or Reserves collections. Interlibrary Loans: Alumni should direct interlibrary loan requests to their public library or any other library with which they are affiliated. Users are responsible for all materials borrowed under their account and will be charged for overdue, lost or damaged items. Borrowing privileges are suspended when overdue and/or fine limits are reached. Alumni should contact Client Support to inquire about the status of their library account. Application may also be made at either Bata Library Service Desk or Durham Branch during operating hours. Privileges may be renewed provided that no materials are overdue and outstanding fines are paid.